Picture framing clamps for clamping picture frames. 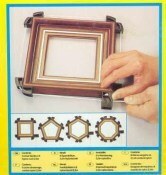 PRM4A is for four sided picture frames. PRM-4.8 is for 4, 5, 6 and 8 sided frames. Image shows PRM-4.